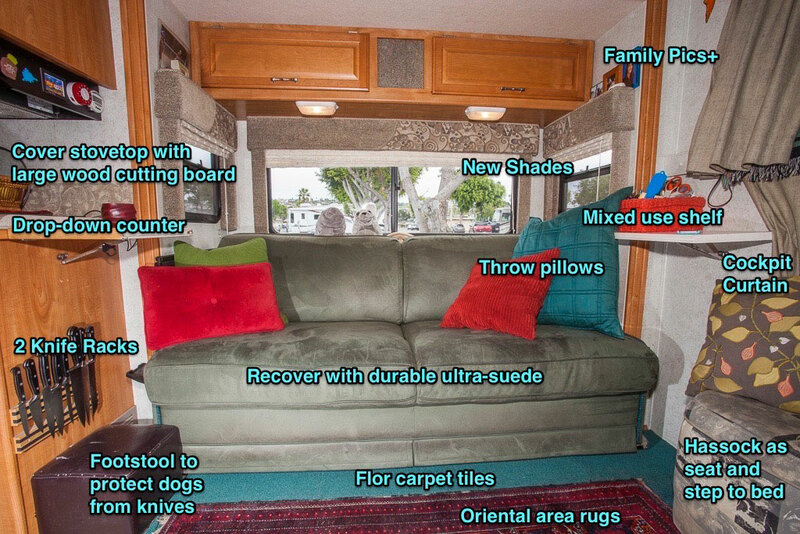 It seems overly simple, but just pulling the shades and curtains on the RV creates home and privacy. I’ve always walked past parked motor coaches with their shades drawn and wondered what it was like inside - just like you do in any neighborhood. 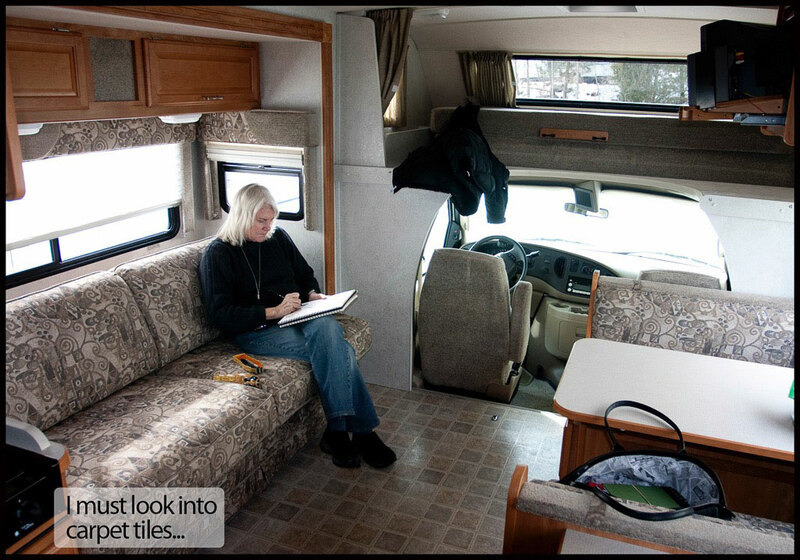 When we button up our RV - lock the door, close the window shades and put up the windshield cover and front curtain - we are home. 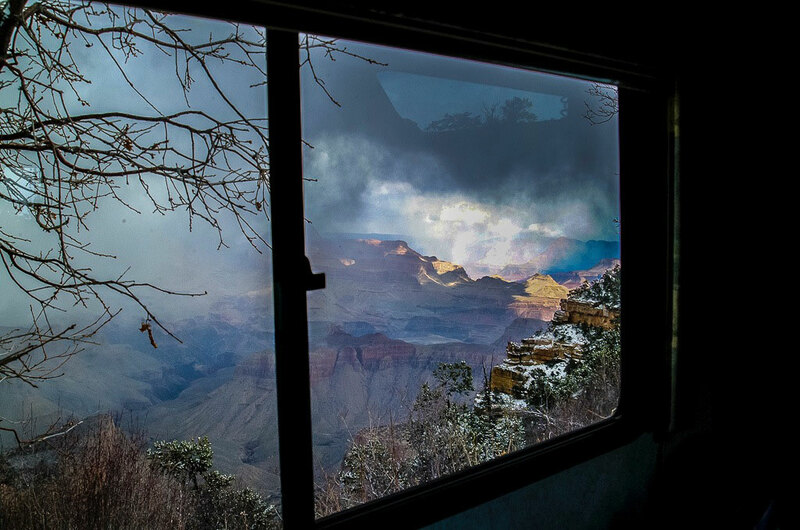 Outside could be the street in a big city or a mountainside or the Grand Canyon… a campground overlooking a beach or a Walmart parking lot but it looks and feels exactly the same to us - home. Safe. There are A LOT of little touches that transformed the factory furnishings into our perfect home environment. OK. Just like a home, it is a COMPLETELY different experience once it is personalized. Each of these items made a huge difference to us. The knife rack made from 2 magnetic racks instead of one actually solved the on the road flying knife problem. Old oriental rugs feel like home. And the extra drop down shelves are the end tables that life always needs. 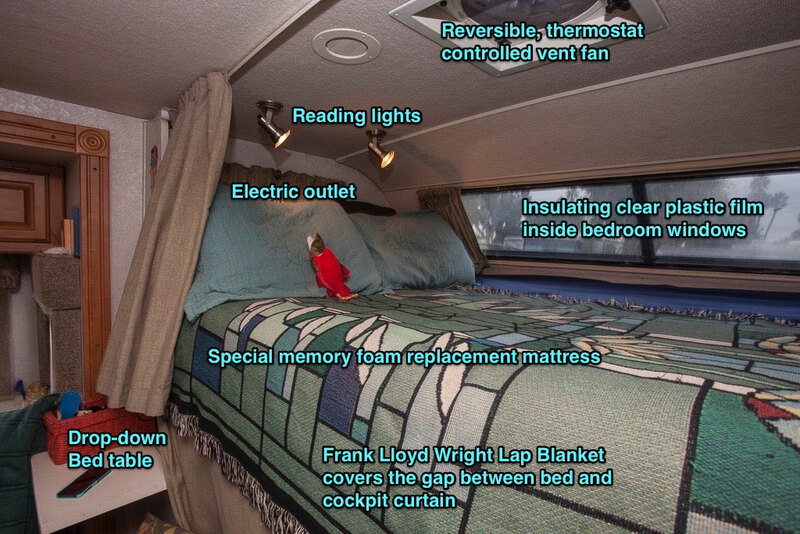 The over-the-cab mattress that comes with RVs is pretty thin and usually divided in two halves. We replaced ours with a queen sized memory foam mattress which has been fabulous. It’s funny, but the two ceiling reading lights we put in are almost never used since most of our bedtime reading books - along with everything else - are on our iPads, backlit. A ladder was provided but we discarded it early-on since just stepping on the top of the dinette seat back works fine to get into bed. The great thing is that the dogs never get in bed with us but know they are right there with the flock. When it comes to just general HVAC comfort when sleeping, we control the temperature when on batteries with the thermostat controlled vent fans in front and rear, moving air between themselves - one pushing air in, the other out. If it’s too cold, the LP gas forced air furnace is turned on - also on a thermostat. When we are hooked up to electric, or running the generator, we can use the central air conditioning or alternately, the space heaters. The key is that temperature control is always available to us, one way or another. The window coverings can act as great insulators of both heat and cold. The front bonnet makes the cab into an out-of-sight storage space for laundry and extras. When it is hot, the bonnet reflects the sun’s heat considerably and in colder weather gives us a mild refrigerator space. The drape that separates the front cab from the living space is very effective at blocking heat, cold and light except at the gap between the top of the curtain and the mattress. We solve this with a decorative throw over the edge. It always feels finished that way. Replacing the roof vents with high volume, reversible, thermostat controlled fans was worth it. 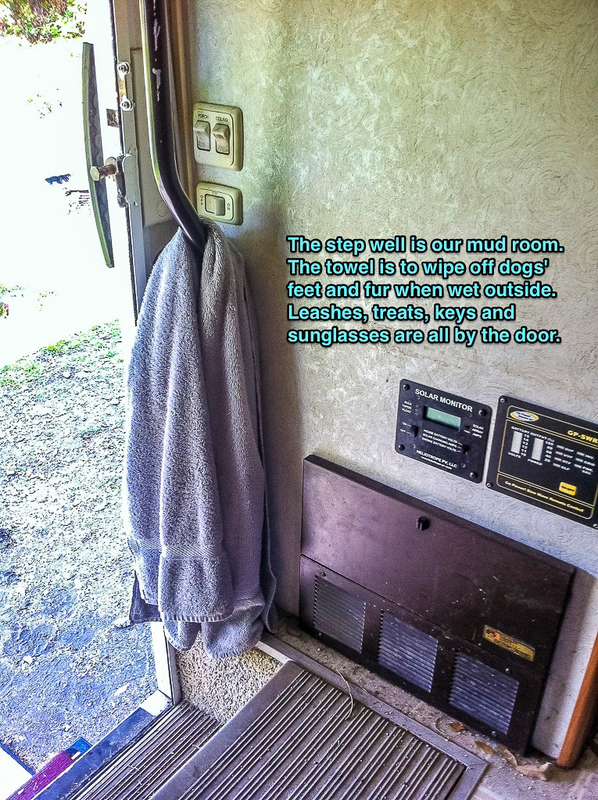 Although campgrounds often have very nice shower facilities, we always prefer to use our own in the RV. It is so well designed. Our shower and bathroom are across the hall from each other, and simply opening the bathroom door across the hallway and closing the folding door on the opposite side creates a spacious feeling bathroom with a tall shower. 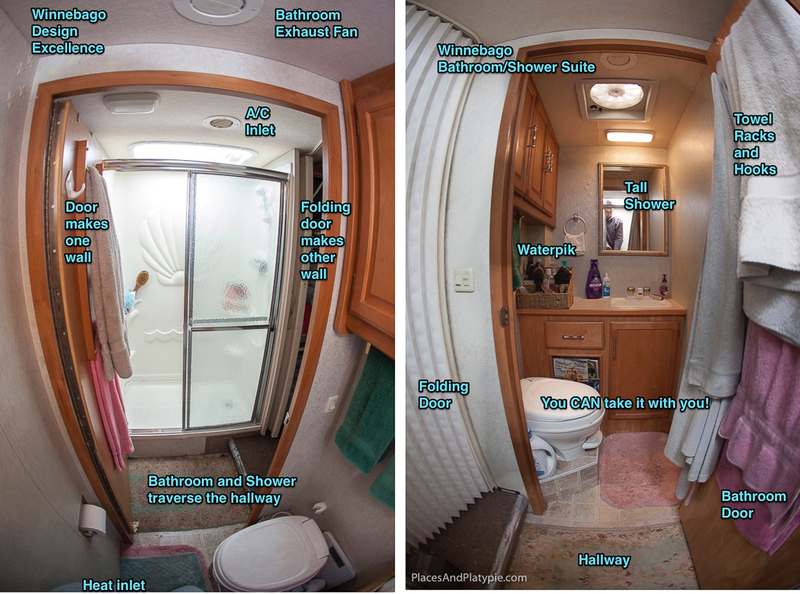 Winnebago designed it perfectly and it makes our life easier and eliminates the uncertainty of traipsing outside with our bathrobes, towels and shower supplies. The only window without a screen was the rear one, meant as an escape hatch. But since flow-through air is SO nice I added Velcro around the edges of a piece of screen and that keeps the bugs out. 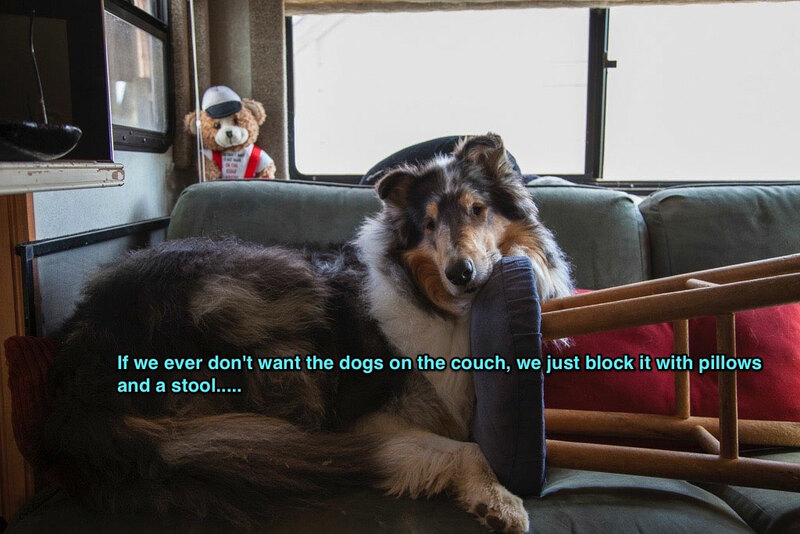 For us there is no life without collies, and so, like having little kids around, you have to make allowances for a certain amount of dirt, leaves, wetness and mess from time to time. (Harry! OUT OF THE TRASH!!!) And the occasional hair shedding perhaps… but it has always been thus. 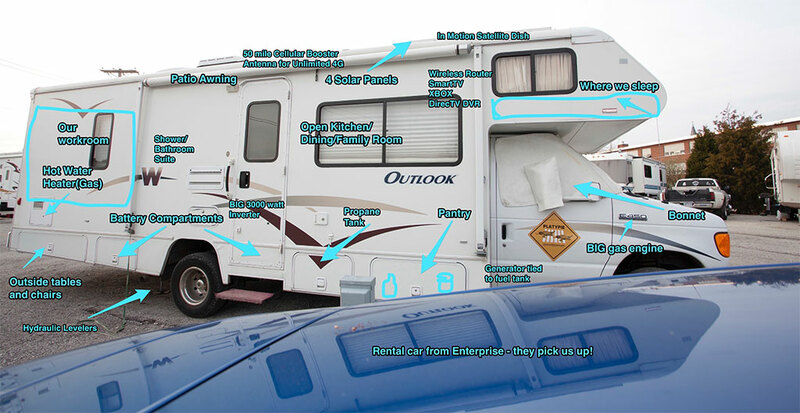 So the doorway to the camper is also the cleanliness gate. We keep a dog towel right there to wipe off wet coats and paws after a walk in the rain, the treats that reward them for putting up with us, grooming combs to get out the inevitable leaves and burs, and, as you can see, it is easy to keep the dogs off the furniture during this process by simply blocking their access with piled pillows and a stool (pictured below)…. Ok, we haven’t got EVERYTHING figured out! Life is pretty darn good in here. Ah, I see the sun is over the cellular data booster antenna on our little land yacht, so time to enjoy a nice ration of rum! Ahrrr, matey! Peg! What a wonderful life the 2 of you and your 4 legged children have!!!! I scan my emails everyday FIRST LOOKING FOR YOUR SITE!!! I think of you so very often and I send you love and Blessings and hope to see you again someday soon. My heart is extra happy today because of you!